From Black Beauty to My Little Pony: Frienship is Magic, humans have an ongoing love affair with horses (and their smaller pony cousins). But not too long ago, the wild creatures that became horses looked considerably different. Where did modern horses originate, and how did they become the domesticated species we know today? A new study sheds some light on the beasts of the steppes that became our most loyal mounts. In the past, different types of data have led researchers to reach contradictory conclusions about horses' origins. Archaeological remains have indicated that domestication occurred in one geographic location, around what is today the Ukraine and western Kazakhstan, and then spread out. But at the same time, analysis of domesticated horses' mitochondrial DNA has revealed the DNA of multiple female ancestresses (as opposed to humanity's Mitochondrial Eve). Meanwhile, though, modern horses also lack diversity in the Y-chromosome, which seems to indicate that a small horse population was domesticated, and then those horses themselves spread across the continent. So how did modern domestic horses start in one location, but with multiple lines of descent? Did the horses spread out from one location? Or did methods of domestication spread among humans in different areas, who tamed the diverse wild herds living near them? 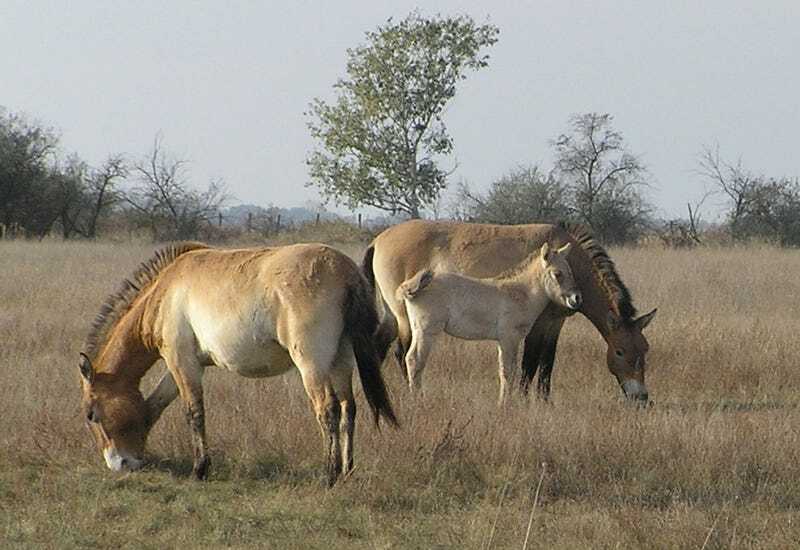 A new study on the topic looks at Equus ferus, an extinct species that sired both domestic horses (Equus ferus caballus) and the wild Przewalski's horses (Equus ferus przewalskii) pictured above. Researchers took genetic samples from over 300 horses currently living east of the Ukraine in the northern part of Eurasian continent (the areas in color in map A) and compared their DNA. Western European horses were left out because they tend to belong to specific breeds, whose histories did not fit well into the model that the researchers were using. Based on the genetic variation in these horses, the scientists could reconstruct the basic structure of the extinct populations of E. ferus. The researchers analyzed different scenarios for Equus ferus that had the horses originate in different parts of Eurasia. The red dots on map C are the possible locations of origin for the ancestral horses. The model that fit best with the genetic samples from modern horses suggested that E. ferus originated near the eastern dot about 160,000 years ago. From the east, they moved across the continent and lived wild for roughly 100,000 years. Then, in western Eurasia — the Ukraine and western Kazakhstan — humans began domesticating Equus ferus, a trend that spread back again towards the east where the wild horses first originated. The blue dots on map D show the possible locations of first domestication that the researchers tested. Although the genetic makeup of the animals in these domestic populations began to diverge from that of wild horses, there was still plenty of genetic mixing when wild stock was added to the herds. And the researchers suggest that rather than sneaky wild stallions mating with domestic mares, most of the wild genes came from wild females that entered a domesticated herd — which would explain the diversity of modern horses' mitochondrial DNA. "In light of the exceptionally high levels of matrilineal diversity in horses, we suggest that introgression from the wild was mainly female-mediated. The repeated capture of wild females for the purpose of maintaining or growing domestic herd sizes may seem counterintuitive, given that in other domestic animal species, introgression from the wild typically involved domestic females being impregnated by wild males. However, given the initial difficulties in breeding the most closely related wild relative of domestic horses, Przewalski's horse, in captivity, it can be speculated that, for an indeterminate amount of time, herd sizes could not be maintained solely through breeding existing stock. Because stallions are inherently more difficult to handle than mares, the easiest way to maintain or grow herd sizes would have been to restock existing herds with wild females." And why the low diversity in the Y-chromosome, which indicates fewer male ancestors? "The observed low levels of Y chromosome variability might reflect the strong domestication bottleneck in western central Eurasia. Additional losses of patrilineal diversity may have occurred as a consequence of successive bottlenecks as domestic herds spread out of the western steppes and of breeding practices reducing the effective size of the male gene pool."